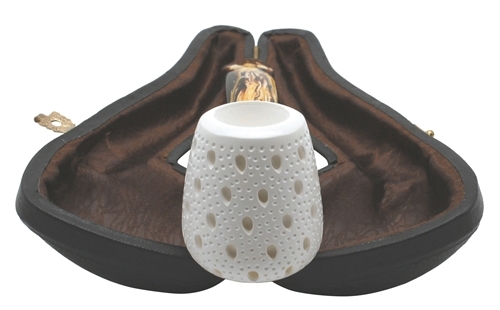 Hand Carved Lattice Oval Shank Meerschaum Pipe - The teardrop lattice is framed with tiny light round lattice carvings that carry to the underneath and shank. The pipe has a flat bottom allowing it to sit without falling to either side. A distinctly colored oval saddle stem is slightly bent and makes a handsome finish to this unique lattice pipe.